1. 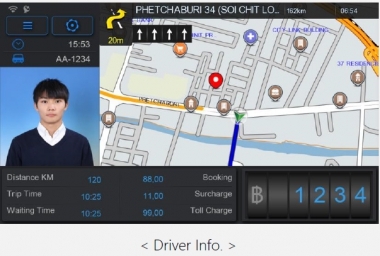 Integrate taxi meter/driving recorder/security monitoring/Google navigation/advertising together. 2. With the connection to ODO Pulse signal it can be used as taxi meter. 3. Support front/in-vehicle/rear-view video recording and photographing simultaneously. 4. With the SOS buttons of driver and passenger, Cloud can monitor the status immediately. 5. Identify driver’s information via RFID and Cloud server. 6. Calculate approximate mileage/time and cost via Google Map in advance. 7. Driver data/approximate mileage and cost/advertisements on passenger screen. 8. High compression ratio and image quality (H.264). 9. Built-in GPS, record the track and speed simultaneously. 10. Built-in WIFI and 3 USB ports, expand the peripheral devices easily. 11. Built-in 4G module, control center can make call、send message and real-time monitor. 12. Support full-featured Cloud monitoring software.